A German museum is exhibiting a 3D-printed copy of Dutch artist Vincent Van Gogh's ear grown from the genetic material of a distant relative. Vincent Van Gogh famously cut off his own left ear during a psychotic episode in 1888. Now, the Centre for Art and Media in Karlsruhe is displaying a replica of this famous ear — one that consists of living cells grown from samples provided by Lieuwe van Gogh, the great-great-grandson of Vincent's brother Theo. The two share about one-sixteenth of the same genes, including the Y-chromosome that's passed down the male lineage. 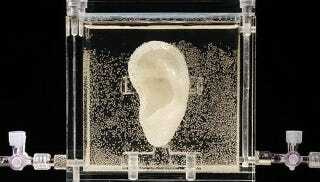 The replica, which was generated by a 3D printer, had its cells shaped to resemble van Gogh's ear as much as possible. The ear was created by artist Diemut Strebe who plans to display the ear in New York next year.